Exosomes have emerged as critical regulators of cell-cell communication. Exosomes are 40–150 nm extracellular vesicles that are generated by all cells and exchanged between cells. Inward budding of the late endosomal membrane encapsulates biomolecules and generates intraluminal vesicles (exosomes) within multivesicular bodies (MVB) . MVBs then fuse with the plasma membrane to release exosomes into the extracellular environment . Exosomes are typically characterized by their size and expression of exosome marker proteins, including CD63, CD81, and CD9 (Fig. 1). Essentially all cell types have been shown to release exosomes in culture [2–14]. Exosomes are rich in RNA cargo and studies have sought to elucidate the mechanisms regulating RNA loading in exosomes. Many species of RNA are present in exosomes, including microRNA (miRNA), messenger RNA (mRNA), vault RNA, Y-RNA, ribosomal RNA (rRNA) and transfer RNA (tRNA) [23–26]. Preferential accumulation of certain RNA species appears to occur within exosomes , suggesting RNA packaging is not random but rather mechanisms exist to package specific RNAs into exosomes. The RNA processing protein Y-box protein 1 has been implicated in packaging of some miRNA  and non-coding RNA  into exosomes. Heterogeneous nuclear ribonucleoprotein A2B1 (hnRNPA2B1) has also been implicated in miRNA packaging in exosomes through its recognition of miRNA sequence motifs . Breast cancer cell-derived exosomes contain components of the RNA-induced silencing complex (RISC)-loading complex, including Dicer, argonaute-2 (Ago2), and TAR RNA binding protein (TRBP), associated with miRNA , which may be an additional mechanism of RNA loading in exosomes. It remains unknown if the aforementioned pathways are broadly applicable to RNA packaging or if additional mechanisms exist to regulate RNA loading in exosomes. In addition to containing RNA species, exosomes also contain several types of DNA. Mitochondrial DNA (mtDNA) [30–32], single-stranded DNA (ssDNA) , and double stranded DNA (dsDNA) [34–36] have been detected in exosomes. DNA incorporated in exosomes can be transferred to and have functional consequences in recipient cells transiently . Exosomal DNA can be transferred to and activate dendritic cells in a stimulator of interferon genes (STING)-dependent manner . While treatment with an epidermal growth factor receptor (EGFR)  or topoisomerase-I inhibitors  increases DNA packaging into exosomes, the precise mechanisms controlling DNA packaging in exosomes remain to be determined. Exosomes have also been implicated as critical regulators of communication between primary tumor cells and distant sites. Exosome secretion is critical for the formation of invadopodia and invasive behavior of breast cancer cells, which may aid in the escape from the primary tumor site . In addition, migratory and invasive behavior can be transferred to non-invasive cells through exosomes . 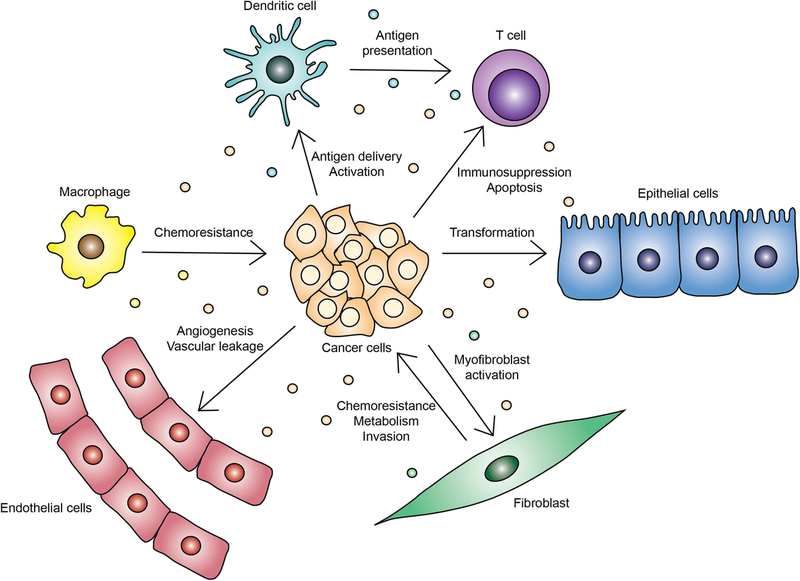 In vivo, uptake of exosomes derived from metastatic cells in cells with lower metastatic capability is associated with transfer of metastatic potential . Inhibition of exosome secretion through knockdown of Rab27A is associated with decreased tumor growth and metastasis in metastatic breast cancer and melanoma models [44, 59]. Rab27A is reported to have functions outside of exosome release, namely in MMP9 secretion ; thus, it remains difficult to discern exosome-dependent from exosome-independent effects on tumor progression. Injection of exosomes derived from metastatic cancer cell lines initiates formation of the pre-metastatic niche through recruitment of bone marrow-derived cells and induction of vascular leakage in melanoma, pancreatic cancer, and breast cancer models [5, 59–61]. 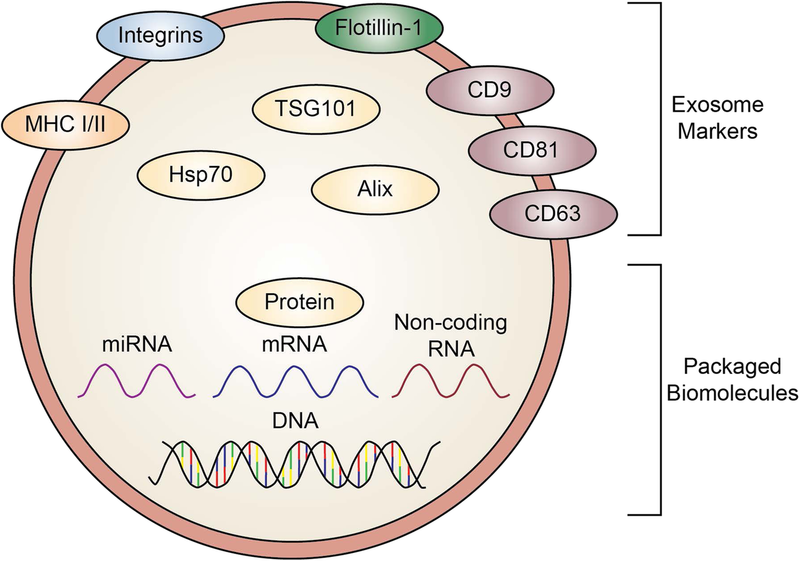 Integrins in exosomes are also associated with metastatic organotropism, specifically α6 is associated with lung metastasis and αv is associated with liver metastasis , suggesting exosomal integrins can predict metastatic site. While these studies suggest exogenously provided exosomes are critical for metastasis, it is unclear if they accurately recapitulate native release of exosomes from tumor cells. Based on the numerous ways exosomes contribute to tumor progression, targeting exosome secretion has emerged as an attractive therapeutic target and has been studied in numerous contexts (Tables 1 and 2). Early studies of exosome release identified ceramide as a regulator of exosome secretion. Ceramide is involved in the inward budding of endosomes to form multivesicular bodies (MVBs) containing exosomes and is generated by neutral sphingomyelinase (nSMase2) . Exosomes are enriched in ceramide and secretion is reduced through inhibition of nSMase2 with siRNA or the small molecule inhibitor GW4869 . Alternatively, treatment of multiple myeloma cells with C6 ceramide induces release of exosomes . A number of other studies have implicated ceramide synthesis in the secretion of exosomes by cancer cells [39, 49, 56, 62–67]. Knockout of nSMase2 reduces angiogenesis and metastasis in breast tumors, which may be mediated through exosome secretion . In addition, mice treated with GW4869 and inoculated with LLC1 cells display a reduced number of lung colonies, likely due to reduced exchange of exosomal miRNAs . GW4869 sensitizes breast tumors to immune checkpoint blockade by reducing secreted exosomal PD-L1 . However, at least one study has reported ceramide as being dispensable for exosome release ; consequently, it remains to be determined if this pathway is a conserved regulator of exosome secretion across all cancer types. In addition, it is unclear if the effects of GW4869 in vivo are due to inhibition of exosome release by cancer cells specifically or through organism-wide inhibition of exosome secretion. Y. Binenbaum, E. Fridman, Z. Yaari, N. Milman, A. Schroeder, G. Ben David, T. Shlomi, Z. Gil, Transfer of miRNA in macrophages-derived exosomes induces drug resistance of pancreatic adenocarcinoma, 2018. doi:https://doi.org/10.1158/0008-5472.CAN-18-0124. M. Mendt, S. Kamerkar, H. Sugimoto, K.M. McAndrews, C.-C. Wu, M. Gagea, S. Yang, E. V. Rodriges Blanko, Q. Peng, X. Ma, J.R. Marszalek, A. Maitra, C. Yee, K. Rezvani, E. Shpall, V.S. Lebleu, R. Kalluri, Generation and testing of clinical-grade exosomes for pancreatic cancer, JCI Insight 3 (2018) 1–22. doi:https://doi.org/10.1172/jci.insight.99263. T.H. Lee, S. Chennakrishnaiah, B. Meehan, L. Montermini, D. Garnier, E. D’Asti, W. Hou, N. Magnus, T. Gayden, N. Jabado, K. Eppert, L. Majewska, J. Rak, Barriers to horizontal cell transformation by extracellular vesicles containing oncogenic H-ras., Oncotarget. (2016) 8–11. doi:https://doi.org/10.18632/oncotarget.10627. C. R Goulet, G. Bernard, S. Tremblay, S. Chabaud, S. Bolduc, F. Pouliot, Exosomes induce fibroblast differentiation into Cancer-associated fibroblasts through TGFβ signaling, Mol Cancer Res (2018) molcanres.0784.2017. doi:https://doi.org/10.1158/1541-7786.MCR-17-0784. V. Luga, L. Zhang, A.M. Viloria-Petit, A. a. Ogunjimi, M.R. Inanlou, E. Chiu, M. Buchanan, A.N. Hosein, M. Basik, J.L. Wrana, Exosomes mediate stromal mobilization of autocrine Wnt-PCP signaling in breast cancer cell migration, Cell. 151 (2012) 1542–1556. doi:https://doi.org/10.1016/j.cell.2012.11.024. H. Peinado, M. Alečković, S. Lavotshkin, I. Matei, B. Costa-Silva, G. Moreno-Bueno, M. Hergueta-Redondo, C. Williams, G. García-Santos, C.M. Ghajar, A. Nitadori-Hoshino, C. Hoffman, K. Badal, B. a Garcia, M.K. Callahan, J. Yuan, V.R. Martins, J. Skog, R.N. Kaplan, M.S. Brady, J.D. Wolchok, P.B. Chapman, Y. Kang, J. Bromberg, D. Lyden, Melanoma exosomes educate bone marrow progenitor cells toward a pro-metastatic phenotype through MET, Nat Med 18 (2012) 883–891. doi:https://doi.org/10.1038/nm.2753. C. Hsu, Y. Morohashi, S.I. 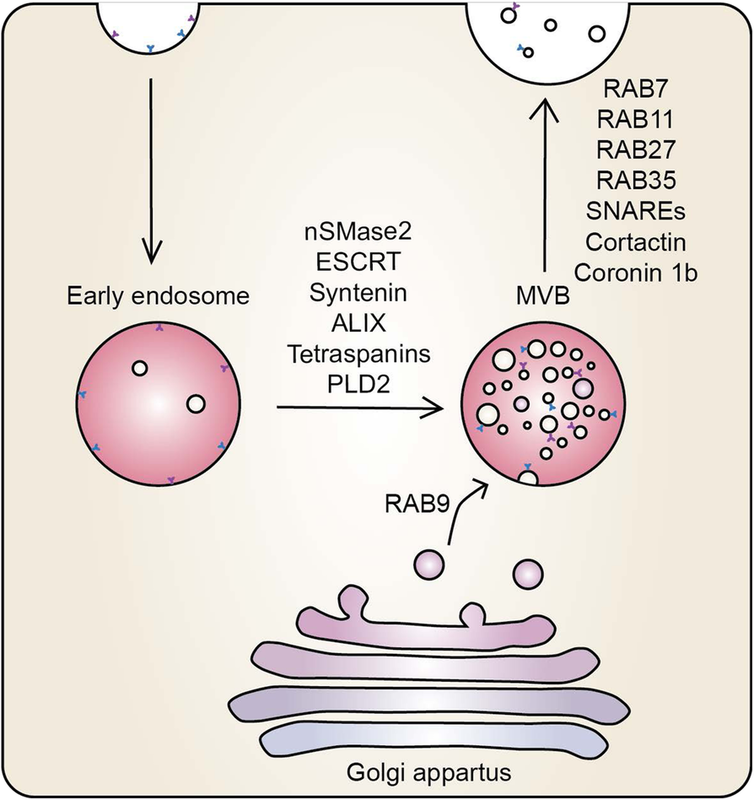 Yoshimura, N. Manrique-Hoyos, S. Jung, M. a. Lauterbach, M. Bakhti, M. Grønborg, W. Möbius, J. Rhee, F. A. Barr, M. Simons, regulation of exosome secretion by Rab35 and its GTPase-activating proteins TBC1D10A-C, J Cell Biol 189 (2010) 223–232. doi:https://doi.org/10.1083/jcb.200911018.